Screen Apart from clique, your screen will be a place where you will interact with friends and indirectly, with companies and institutions. Access this feature by clicking on the Menu icon, then click Screen. Your screen serves as a place to write down your thoughts and opinions, similar to a microblog. Your friends can view and comment on your posts and similarly otherwise. 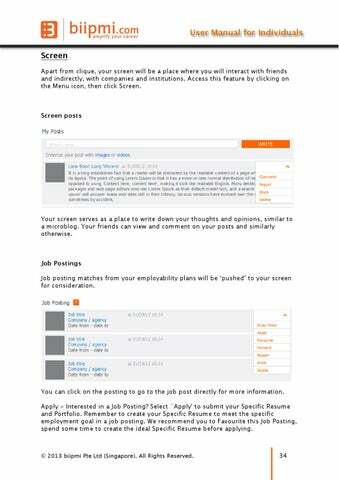 Job Postings Job posting matches from your employability plans will be ‘pushed’ to your screen for consideration. You can click on the posting to go to the job post directly for more information. 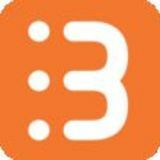 Apply - Interested in a Job Posting? Select `Apply' to submit your Specific Resume and Portfolio. Remember to create your Specific Resume to meet the specific employment goal in a job posting. We recommend you to Favourite this Job Posting, spend some time to create the ideal Specific Resume before applying.